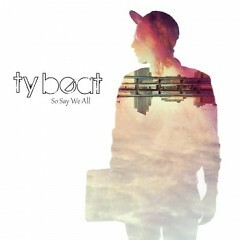 Ty Beat released a full length album last Tuesday as a free download. Check out the tunes and keep your eye out for Ty Beat playing regional shows. Grand Rapids fans of electronic music should be quick to scoop up the full length album So Say We All, from local producer Ty Beat. If for no other reason, do it because it is a free download and your eardrums can always use some new tunes. Ty Beats brand of Trip-Hop/Space Electro blends bouncy beats, bleeping synth's and collaborations with singer Caralie Raymond and the lyricist Matt Black. The album has been released on Young Heavy Souls Records, which also hosts a variety of other local artists music, several of such albums are a free download as well. Ty Beats last record was in collaboration with local MC Friendly. This album will prove to be a large stride for Ty Beat, who isn't just a beast in the studio, but can really hold his own on the stage. Not just flipping beats, Ty Beat also plays the keys, jumps on the drum set and adds some vocals to his bass heavy tracks, well focused toward the dance floor, in a low down dirty sort of way. Key tracks for me include Bordeaux, a funky introspective instrumental that evokes feelings of overcoming something heavy and moving forward in a positive light. The track Low Down also jumped out for me as a soulful tune featuring some nice lo-fi piano and a nice walking tempo. As a huge hip-hop fan, I couldn't help but get down on the song Uncaged, featuring Matt Black. The song The E.A.C has a special recipe of steeze mixing dubstep flavor with interesting ambitious percussion. I recommend checking out the album yourself here to see how the tracks move you. Keep your eye out for Ty Beat's live shows as I would expect to see him venturing beyond the Michigan range in the near future. You can catch him tonight (Friday, December 7) at The Pyramid Scheme supporting Afro Zuma, SP3, with Badenya Drum and Dance to tag along, and likely some other surprises.